Mix all ingredients together. Knead it and form a a ball. Let rest for 3 hrs in a cool spot. Roll out the dough with a rolling pin. Line a pie tin with this. Line the pastry with parchment paper or aluminum foil. Weigh it down with chickpeas or rice. Bake 15 minutes. Remove lining and weights. Prick holes in the bottom with a fork. Boil water in a saucepan. Blanch almonds and peel them. Put them in a food processor and chop then. Add chicken or mutton broth and let sit 5-6 hours. Strain the mixture through a cheesecloth and set aside. Peel onions. Cut them in half and then thinly slice. Heat a large frying pan. Add lard. When melted, fry the bacon in it. When golden brown remove bacon and set aside. When cool, crumble it. 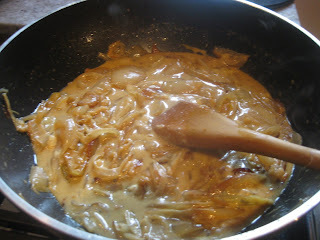 Add olive oil and when hot add onions. Cook 10-15 minutes over moderate heat until translucent. Add almond milk and ½ the cheese. Simmer 40 more minutes uncovered to thicken like marmalade. Add salt to taste. Beat yolks. Turn off the heat under the onion ragout and add the egg yolks. If serving as ragout, let sit for 10 minutes. Sprinkle with crumbled bacon and serve. Pour the mixture into precooked pie shell. Sprinkle cheese over it and then the crumbled bacon. Cover with aluminum foil to prevent exposed pastry from burning. Bake in the oven 30-35 minutes until the center is set. Remove aluminum foil after baking 20-25 minutes to brown exposed pastry if necessary. When the center of the quiche is set, remove it from oven let sit 10 minutes before serving. 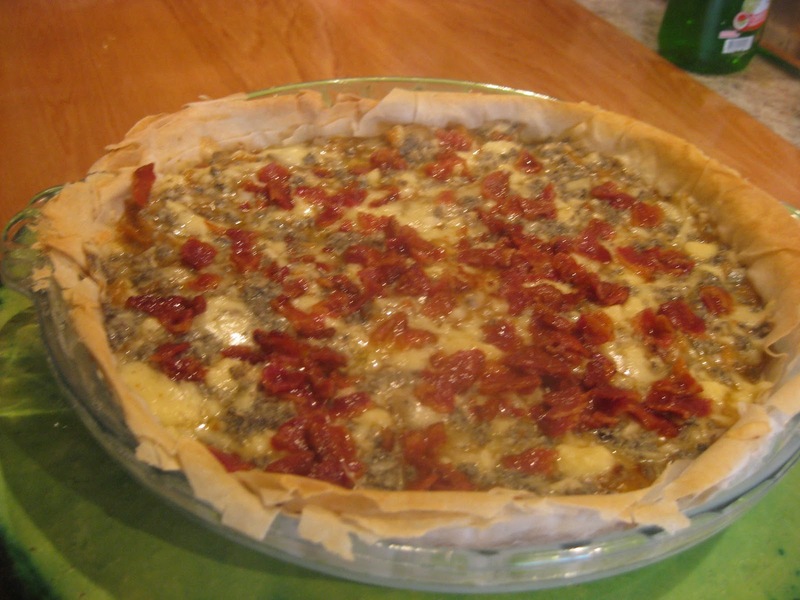 Llandonosa suggests using this recipe to make a quiche for a better presentation. If mutton broth is not available use 1 ½ qts water and 2 meat bouillon cubes or i making quiche: 1 c water and 2 bouillon cube. A mixture of gruyere, parmesan and blue cheese were used as seen in the last photo. Just found your site and I'm salavating already! Our 16th century Spanish reenactors here in Florida are going to love this! Thank you for all your research. Many thanks! - You know my family and I have to eat this stuff. I have started ranking our reactions, one out of ten. This one is a 10. 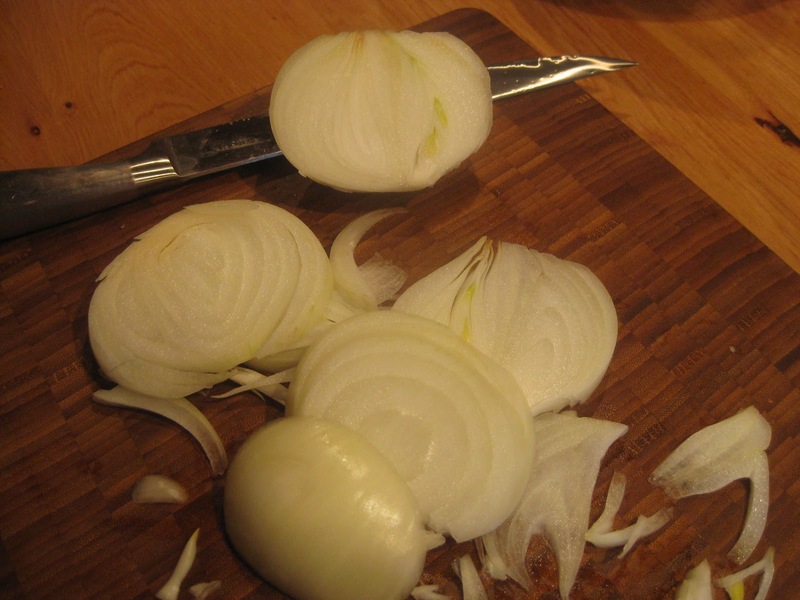 It is so good It is worth a few tears if slicing onions bothers you.